The Directors Lab West Steering Committee has announced the dates for its 12th annual event. The 2011 Lab will take place June 11 – 18 in residence at The Pasadena Playhouse. This year’s dates coincide with several other events bringing national attention to the L.A. theatre scene, including the Theatre Communications Group (TCG) annual conference. This will be an exciting time to explore current issues and perspectives in both the local and national theatre communities. Attendance is by application only. There is no charge to participate; applications and more information can be found at www.directorslabwest.com. The deadline for receipt of applications is Friday, April 15 at 5pm. Directors Lab West, which launched in 2000, seeks theatre directors to participate in a week-long series of workshops, panels, roundtables, and symposia, with some of the nation’s leading theatre artists. Directors Lab West, like its New York inspiration at Lincoln Center Theater, creates an intensive laboratory environment where theatre directors come together to inspire, educate, and challenge themselves and each other. 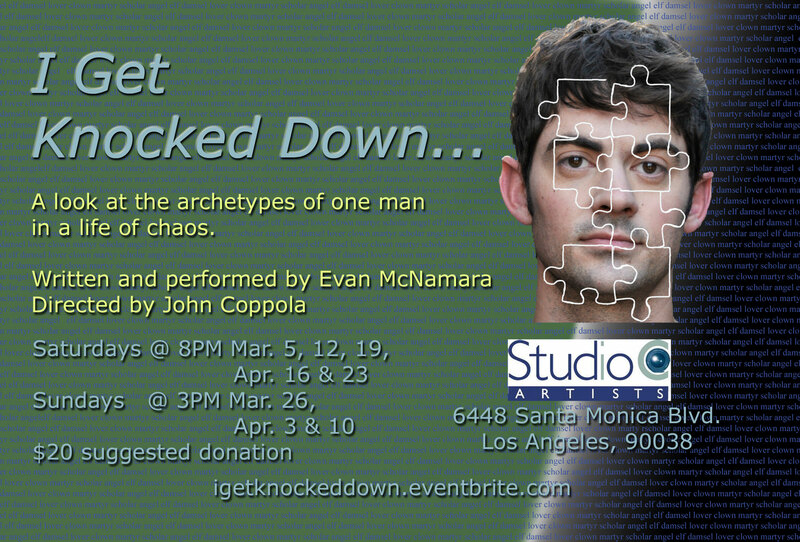 Studio C Artists has announced the world premiere of I Get Knocked Down … , written and performed by Evan McNamara, and directed by John Coppola. This new solo show is set to open on Saturday, March 5 at 8pm and will run on alternate Saturdays and Sundays through April 23. Performances will take place at the Studio C Artists Performance Space on Theatre Row in Hollywood. I Get Knocked Down … is one man’s journey across relationships and heartbreak, as told through fragmented parts of his personality. Each fragment lends insight into how he was blinded by love, and ultimately blind-sided by betrayal and the dissolution of his marriage. Writer/performer Evan McNamara gives a tour-de-force performance as the father of two kids exploring the recent breakup of his home by delving into seven archetypes that are unique to his psyche. Evan’s journey within provides a deeper understanding of the meaning of unconditional love, and ultimately proves the power of self outshines even the darkest times. Evan McNamara was born and raised in the suburbs of Philadelphia, where his career as an actor began in the third grade, playing the Pied Piper of Hamelin. Dreams of a professional acting career brought him to Los Angeles, where he has worked on stage, in film, and on television. Local theatre credits include Amadeus, You Can’t Take It With You, and The Shadow, among others. Television work includes The Soup, ER, Taprooting, Silence and The Last Bad Neighborhood. Evan has been a company member of ARTEL, Shakespeare by the Sea, and L.A. Troupe, and is presently a company member of Studio C Artists. John Coppola was born into a filmmaking family in Brooklyn, New York, and has had a multifaceted career as a director, producer, actor and teacher. He began his acting career over 20 years ago while attending Yale’s prestigious Dramat Purple Crayon. He has appeared on Broadway numerous times (Brighton Beach Memoirs, Biloxi Blues, American Buffalo) and in films such as Into the Paradise, Last Exit to Brooklyn, Out of Gas on Lover’s Leap, and You Gotta Leave Your Mark. As a director, John has helmed over 25 theatrical productions in New York, Los Angeles, and abroad. The movie Possibility, which he directed, took the 2005 Grand Jury Prize for short film at the New York International Film and Video Festival. As part of Studio C, John offers unique private coaching to a thriving group of students, established actors, and movies stars. Based in Los Angeles, Studio C Artists is a production, casting, and arts education company founded by director John Coppola and producer Michael Sonntag. The production unit focuses on film and television – primarily features, documentaries, scripted series, and web series. In addition, Studio C Artists develops projects for the stage, with the intention of working some of them into material for the screen. The Studio C Artists Acting & Filmmaking Institute is an all-encompassing acting studio, which offers a curriculum of acting classes, career-related seminars, and filmmaking workshops. The curriculum emphasizes The New Approach – a unique formula taught only at Studio C, which has been cultivated and perfected over the last 10 years. Studio C Artists’ clients range from up-and-coming actors to major film and television stars, and are represented by some of Hollywood’s busiest agents and managers. For more information, visit www.studiocartists.com. 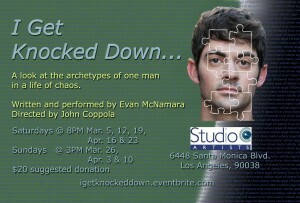 The running schedule for Evan McNamara’s I Get Knocked Down … is as follows: Saturdays, March 5, 12 & 19 and April 16 & 23 at 8pm; Sundays, March 27 and April 3 & 10 at 3pm. Approximate running time is one hour. Suggested donation is $20, and reservations can be made by visiting www.igetknockeddown.eventbrite.com. The engagement ends on Saturday, April 23. Studio C Artists is located at 6448 Santa Monica Boulevard, on Theatre Row, in Hollywood. The Elephant Theatre Company, David Fofi and Lindsay Allbaugh, Co-Artistic Directors, has announced it will present this year’s annual short play festival as a “best of” encore anthology. THE BEST OF LOVE BITES: 10 Years Together … and Still No Ring will be split into two separate evenings of short one-acts that will run in repertory from Thursday, February 17 through Sunday, March 20. The two programs (‘Round One’ and ‘Round Two’) represent the best original short plays produced by the Elephant Theatre Company over the last ten years during its annual one-act festival, which has become a local ‘cult’ favorite. All of the plays, which will be performed at the Elephant Space in Hollywood, are written, performed and directed by members of the Company. Kicking off the Elephant’s 15th Season, THE BEST OF LOVE BITES: 10 Years Together… and Still No Ring is a delicious assortment of short plays featuring dark humor, grand delusions and outright goofball shenanigans, all examining that elusive thing called love. Though it never bows to the conventions of a Hallmark greeting, LOVE BITES has become a hallmark of the Elephant Theatre Company’s distinctive excellence. To purchase tickets for regular performances and for the Anti-Valentine’s Day event, visit www.ElephantTheatreCompany.com or call (877) 369-9112. The Elephant Space is located at 6322 Santa Monica Boulevard (one block west of Vine), in Hollywood. Street parking is available.